Course Generator is a software which can estimate your time in road running races, trails, ultra trails or treks. Created in 2008 for my personal needs, it has not stopped evolving and it allows, today, to do much more than the estimation of your travel time. Estimate your time at each point of the track. Course Generator is Open Source, multiplatform (Windows, MacOS and GNU/Linux) and multi-language. His code is available on Github. You can also help the author by advertising around the software. I gain nothing but knowing that what I created is used by a growing number of users is rewarding. You can download the last version in the download section. You will find the latest news about Course Generator in the blog. Generate a fully customized mini-roadbook. Very useful to have global view of the track. Export a portion of the track in GPX or CGX format, for example to recognize the track in 4 steps. Reverse the direction of the course. Change the starting point. For example to start from Courmayeur. Save all your settings in CGX format (Course Generator file format) in order to exchange all your settings with your friends. The video below shows you how Course Generator works (old version of the software but the principle remains the same, currently in French 🙁 ). 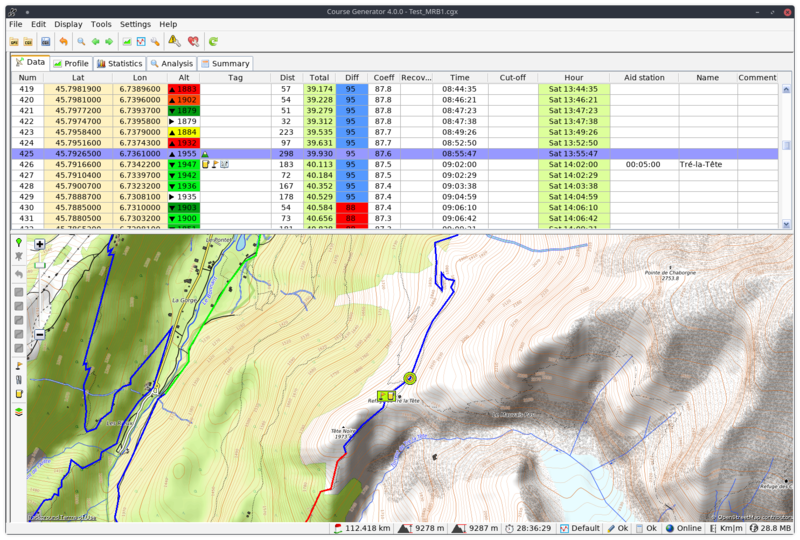 Course Generator offers the possibility of generating a mini-roadbook. This will contain the profile of the track and information about your way points. The “Simple” type. The profile of the track does not contain any additional information. The “Road / Trail” type. The profile highlights the portions of road and trail by a color code. The “Slope” type. The profile highlights the degree of slope by a color code. The settings made to generate the mini-roadbook are saved in the CGX file of the track. If you exchange a track in CGX format, you exchange the track with all its information (station, quality of the terrain, cut-off times …) and the mini-roadbook. If you are convinced, made a tour through the download page.